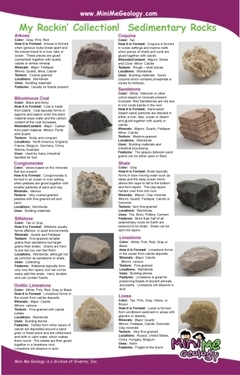 Enjoy learning about rocks and minerals with this set of four rock and mineral identification flyers. 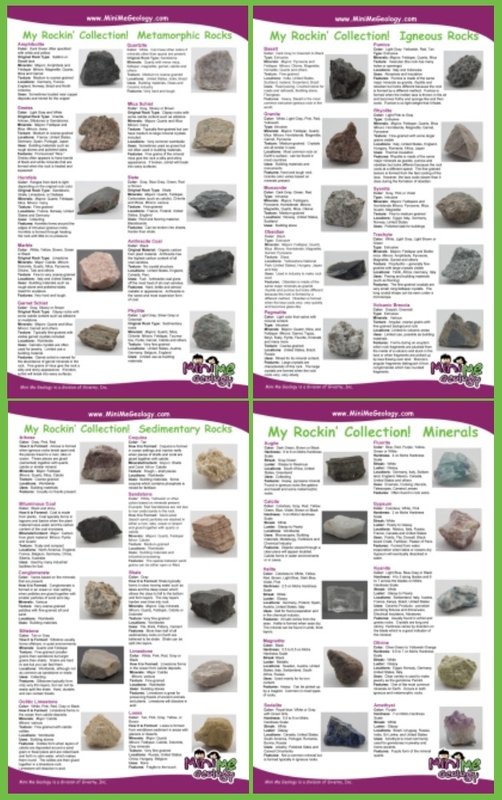 These are the same flyers included in our Junior kits and are perfect if you have a rock collection or if you are looking for an inexpensive way to introduce rocks and minerals as a hobby to your children or in school for earth science lessons. Each flyer features 10 of the most common samples found in natures. Flyers include minerals, igneous rocks, metamorphic rocks and sedimentary rocks. Mineral flyer includes: augite, calcite, fluorite, gypsum, halite, kyanite, magnetite, olivine, amethyst, and sodalite. Igneous Rock flyer includes: basalt, granite, monzonite, obsidian, pegmatite, pumice, rhyolite, syenite, trachyte and volcanic breccia. Sedimentary Rock flyer includes: arkose, bituminous coal, conglomerate, coquina, loess, fine-grained limestone, banded sandstone, shale, siltstone, and oolitic limestone. Metamorphic Rock flyer includes: amphibolite, gneiss, hornfels, pink marble, phyllite, quartzite, schist, slate, garnet schist, and anthracite coal.